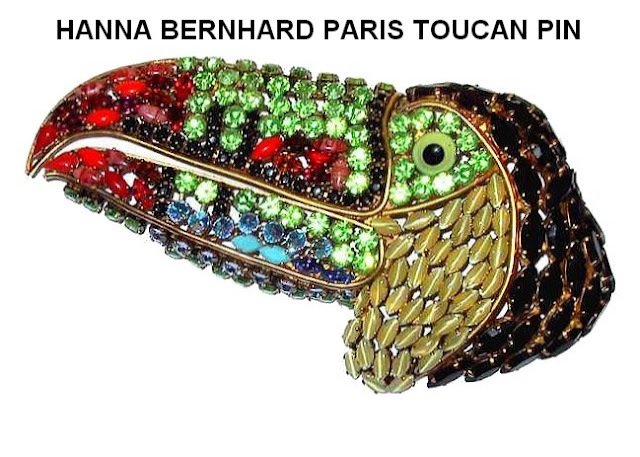 HANNA BERNHARD JEWELRY PARIS: THE POWER OF BLOGS: IRIS APFEL TOUCAN REPRO IS OUT ! This an update for all the readers, bloggers, friends from everywhere who have followed this story since the last 48 hours ! I got a phone call from Brad Bohnert from HSN yesterday evening, telling me how sorry was his company for all the trouble they caused us, that they have decided to take the toucan pin out of Iris Apfel for HSN jewelry collection. He also said that he will publish this new on their facebook page so everybody can read it. He said that Iris Apfel has called them, it is a misunderstanding, she has purchased the toucan pin in a flea market and thought it was a vintage piece ! This is very funny indeed. I am French and my English is quite approximative but I don't picture a Palm Beach show as a 'flea market' : am I right ? Of course HSN will launch Iris collection on their site in September, so they are protecting them, her and their business, but this is still a big lie. 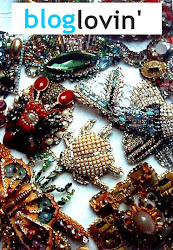 Iris collects our jewelry, we went to her place and she showed us the pieces that she bought in Palm Beach, so she perfectly knew what she was doing. I have read some comments on Atlantis home blog, as Judy is the first who announced the 'good new' : I am happy that readers were not fooled with the 'flea market' excuse. ANYWAY, the main thing is that they won't be selling the repro toucan pin, and I have found out with this affair how nice people cared about it, sending encouragement messages and advices : from the bottom of Fernand's heart and mine, we will never forget it, I wish we could all meet to celebrate ! This victory is not our victory, it is the victory of all the creators in this world who are working with their heart and soul, who are small and unknown. I hope that it will help them and give them hope that something can always be done, we are not always David in front of Goliath ! With the power of blogs nowadays, it looks like anybody can be heard, and not only the powerful people or companies. We are extremely grateful to JANE and JUDY ALDRIDGE from blogs SEAOFSHOES and ATLANTIS HOME, without who this would probably have not been possible. LOVE TO ALL AND THANK YOU AGAIN SO MUCH FOR ALL YOUR SUPPORT !!!!! Fernand and Nathalie - Hanna Bernhard team. PS : some images have circulated on the net with the 2 toucan pins, with a mistake of attribution. YAYA You got it worked out all i can say is SHAME ON HER! And that is what i say to my 3 year old. Congratulations! Good thing they pulled the copy before the launch of the HSN line. Hang in there, Hanna Bernhard team; not all publicity is bad! Congrats! But if I were you I'd still sue, to be in line with the "this is a win for all small designers" ...time to speak out louder. So glad all this got worked out. I love your pieces and won't be purchases anything from her collection because of this as who knows? Maybe some lesson know designer has pieces in 'her' collection. We don't know. Im so happy for you all the blogging workd I read about this allll the way over here in beverly hills!!! Just received my package of Iris's HSN collection today. Looked on the Internet for more pieces and saw this new (to me)artist! I look forward to discovering Hanna's work when I am in France this coming summer!! Do you folks have a facebook fan web page? I looked for one on twitter but could not uncover one, I would really like to change into a fan! I really appreciate this post. I have been looking all over for this! I found this site on Google. It was excellent and very informative. I have read a few of the articles on your website now, It’s really a great and useful piece of info. Actually like your web sites particulars! Undoubtedly a beautiful supply of information that is extraordinarily helpful. Carry on to carry publishing and that i’m gonna proceed reading by way of! Cheers. "A few genuinely grand work regarding online resources this specific site, perfectly outstanding articles." "I might constantly wish to be bring up to date in brand new blog posts about this site, saved to bookmarks!" I stumbled on this web site after reading great info on anormalbloodsugarrange.com. When I read your citygates, I noticed the uniqueness of it and I seriously find it very intriguing. Well done!